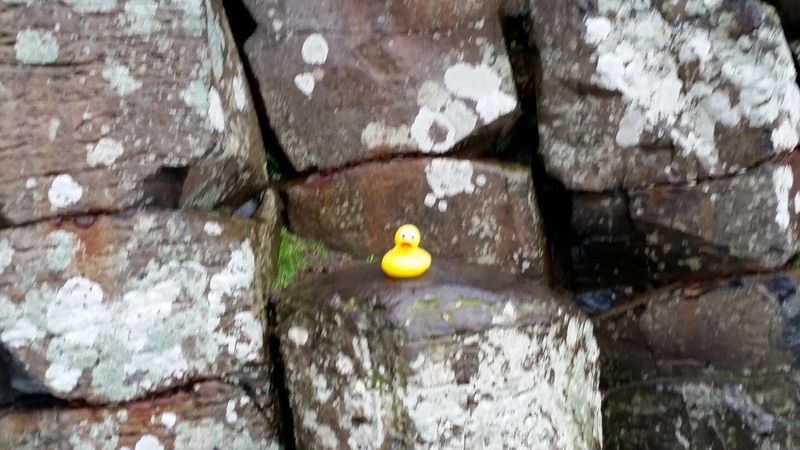 I, Zeb the Duck, was so excited to hear about Ms. Ducky’s trip to Ireland. 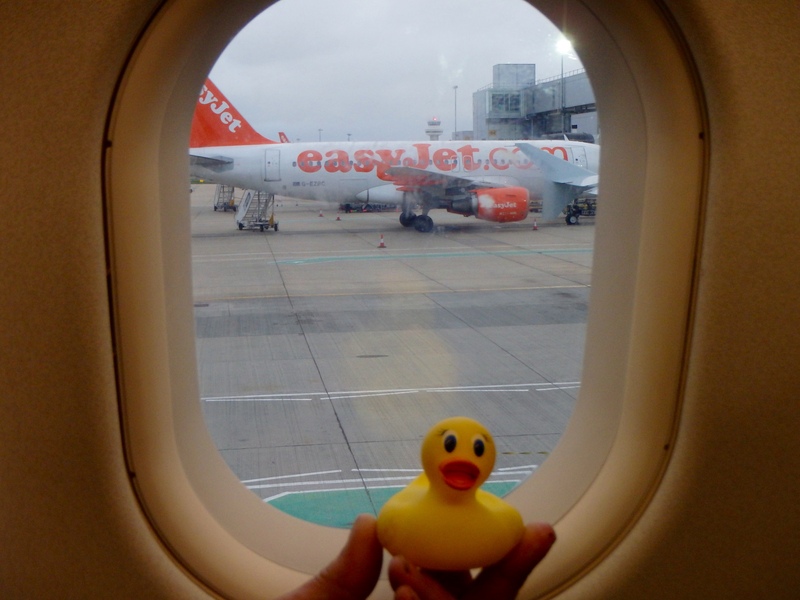 This is Ms. Ducky’s second trip to Europe this year. I asked her to tell you about it and show you what she did. 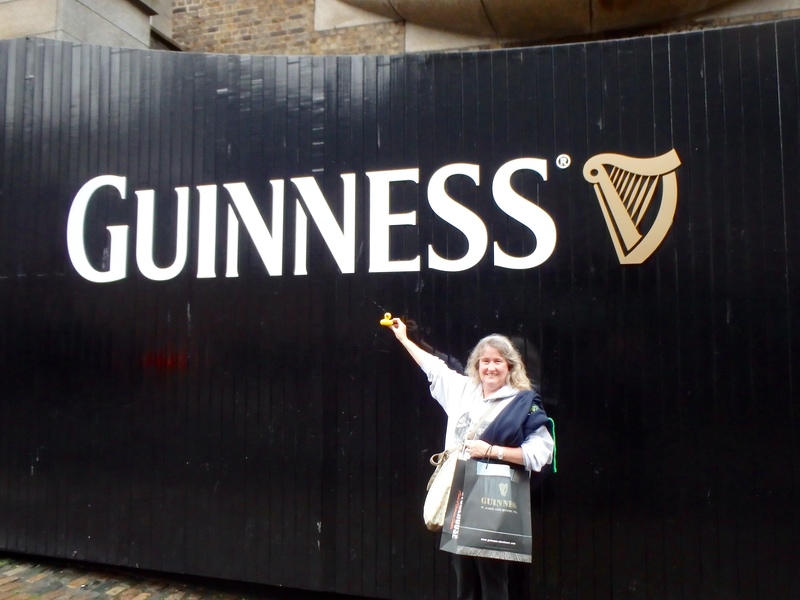 I, Ms. Ducky, flew to London and then flew to Ireland. 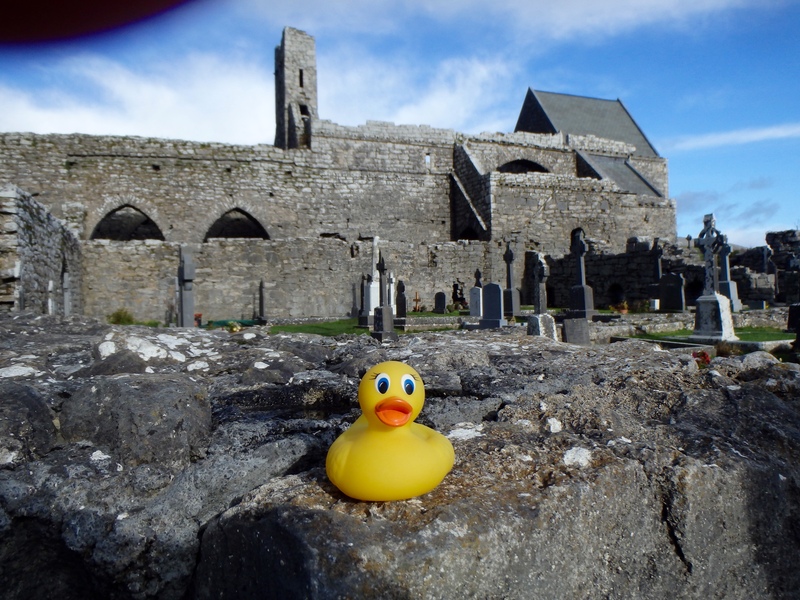 When I arrived in Ireland, I took my humans to see this ancient church. Guinness produces alcohol, and of course, the Guiness Book of World Records. Today we were more interested in alcohol than books. Let’s go inside. This is a nice place. Guiness. I like it here. Next we visited Belfast, Ireland. Ireland has a troubled past. 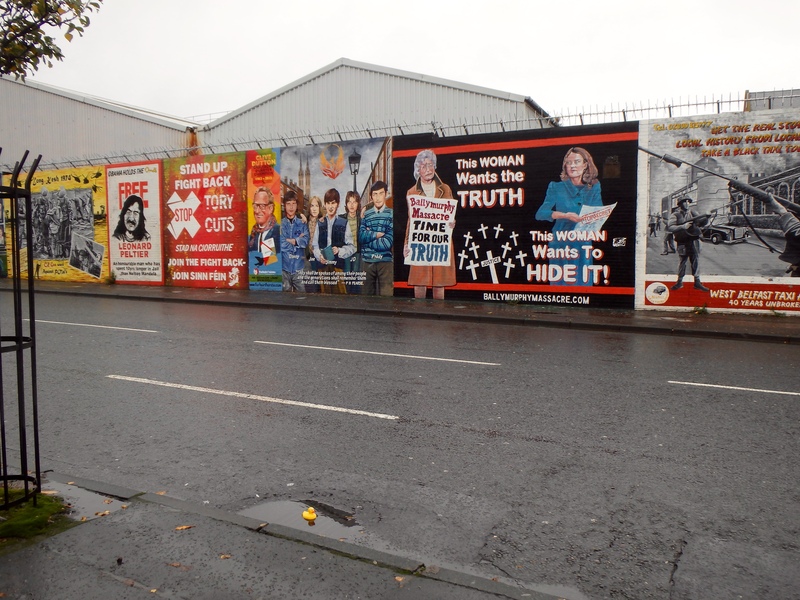 The city of Belfast has 17 peace walls. They were built to protect neighborhoods during times of trouble. 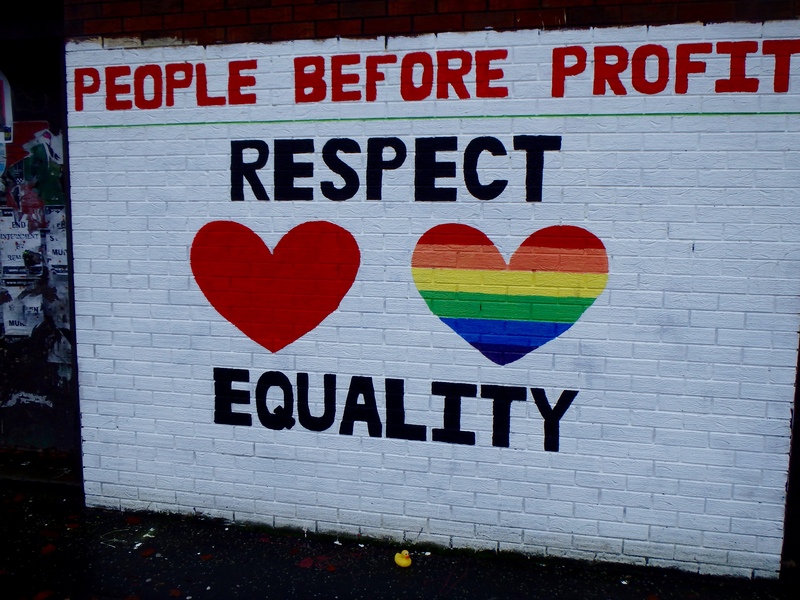 These walls are painted by the citizens. My humans and I visited the Shankill side where we were encouraged to sign the wall. 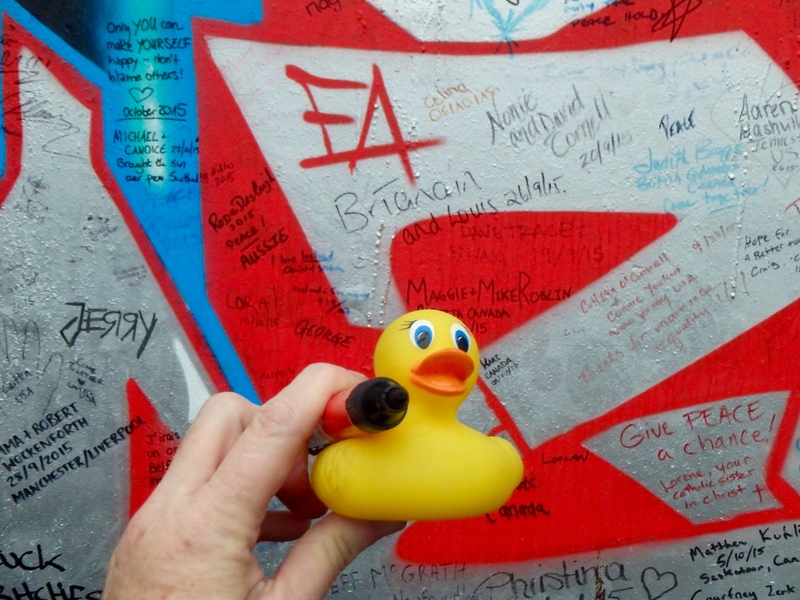 As a peaceful duck, I eagerly added my signature. Next I take my humans to Northern Ireland’s northeast coast. 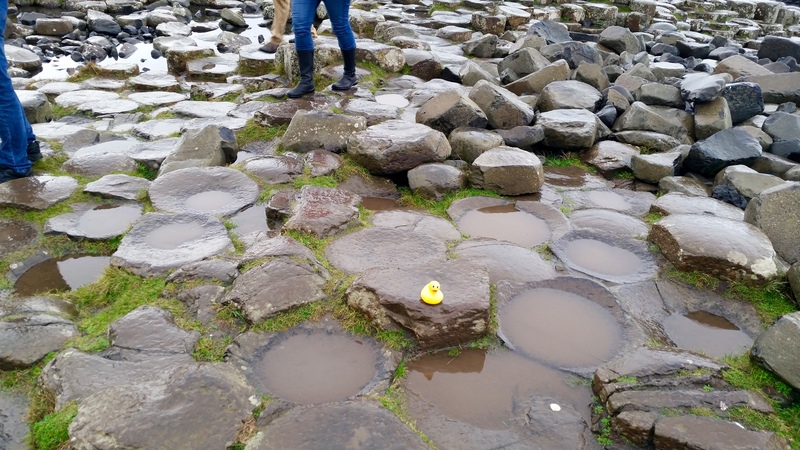 This is Giant’s Causeway, an area of about 40,000 interlocking basalt columns, the result of an ancient volcanic eruption. The tops of the columns form stepping stones that lead from the cliff foot and disappear under the sea. The tallest columns are about 12 meters (39 feet) high. The solidified lava in the cliffs is 28 meters (92 feet) thick in places. Legend says that the columns are remains of a causeway build by a giant. 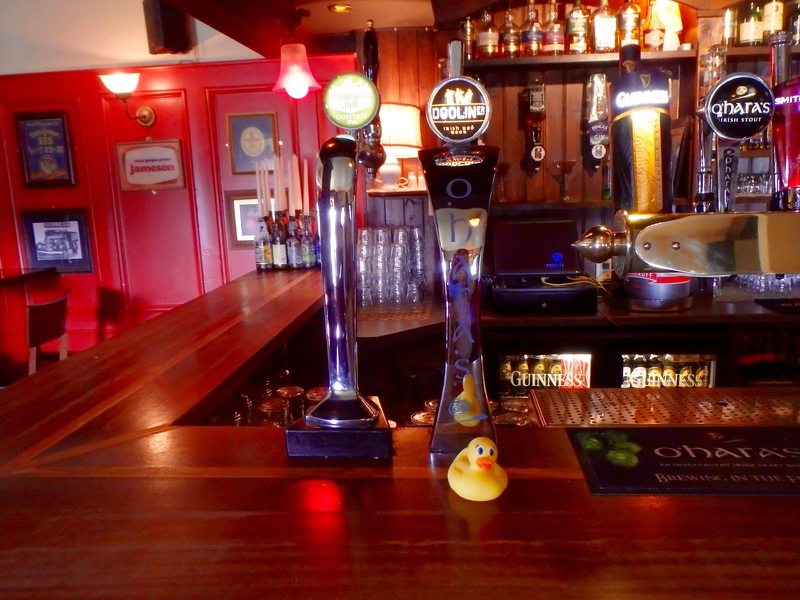 All this exploring makes a duck hungry and thirsty. We enjoyed lunch at The Nook, here at the Giant’s Causeway. Soon we returned to Dublin. 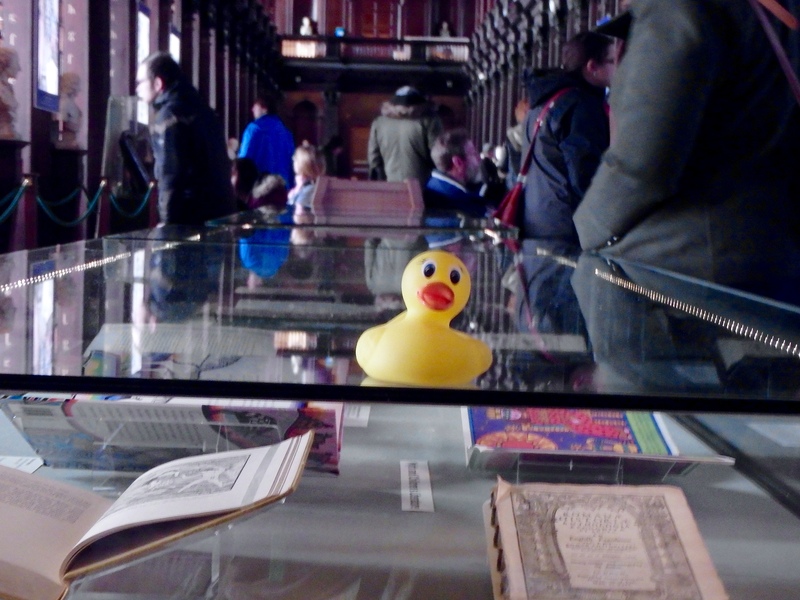 I, Ms. Ducky, am very smart, so I head for the Book of Kells at Trinity College Library. Now I am inside the Long Hall in Trinity College. Long Hall Trinity College. I like Harry Potter. I sit at the feet of George Salmon, Provost 1888-1904. 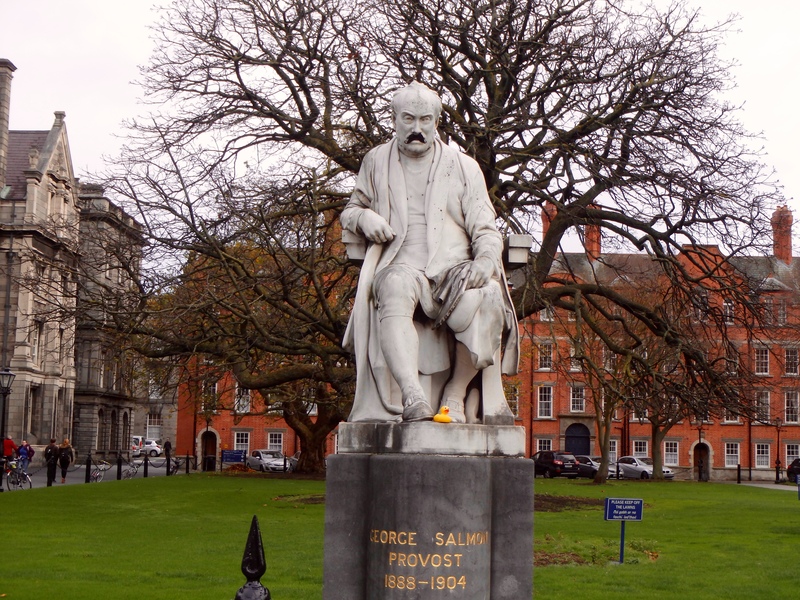 George Salmon graduated from Trinity College Dublin. He was a highly regarded mathematician, and also an Anglican Theologian. 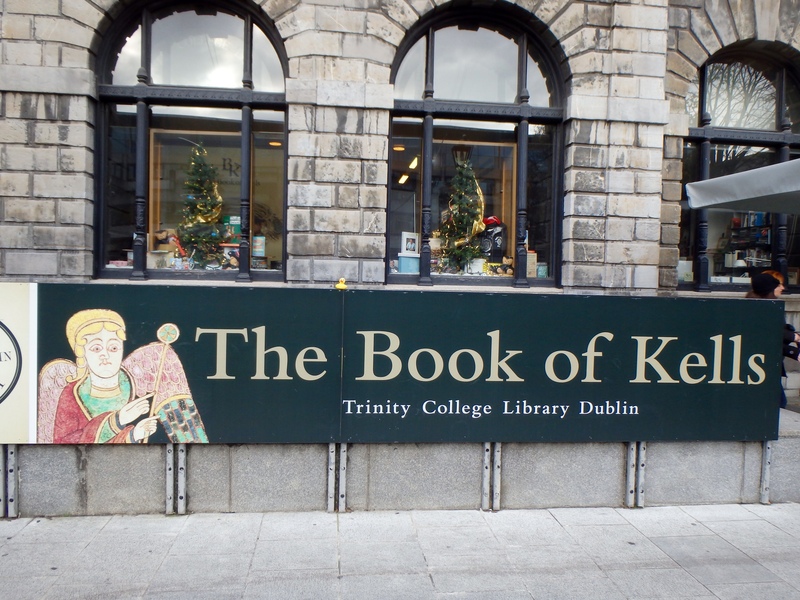 He spent his entire career at Trinity College Dublin. This is my new friend, Molly Malone. The song “Molly Malone” was based on fictional tale of Molly, a fishmonger by day, and part time prostitute by night. This statue of Molly was unveiled in 1988 on Grafton Street. June 13 is Molly Malone Day. The statue was relocated to Suffolk Street in front of he Tourist Information Office. 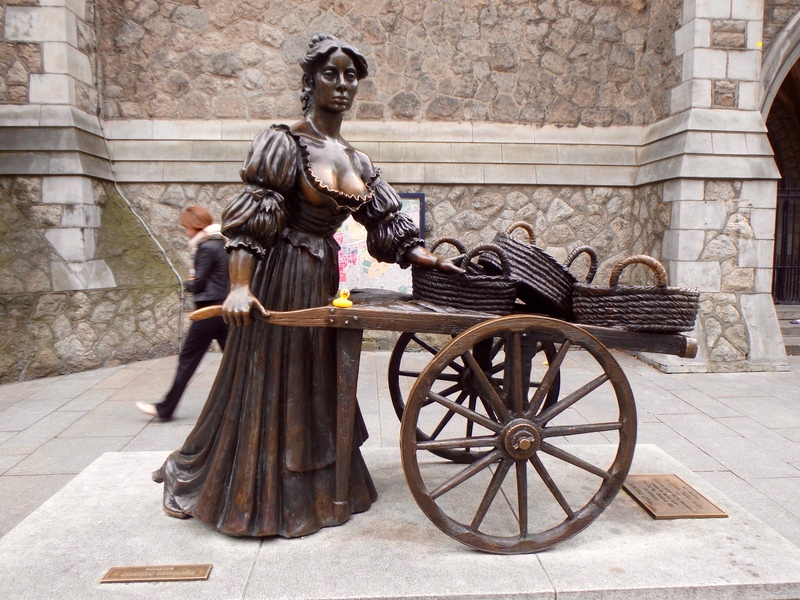 According to Wikipedia, Molly Malone is also portrayed as one of the few chaste female street hawkers of her day. 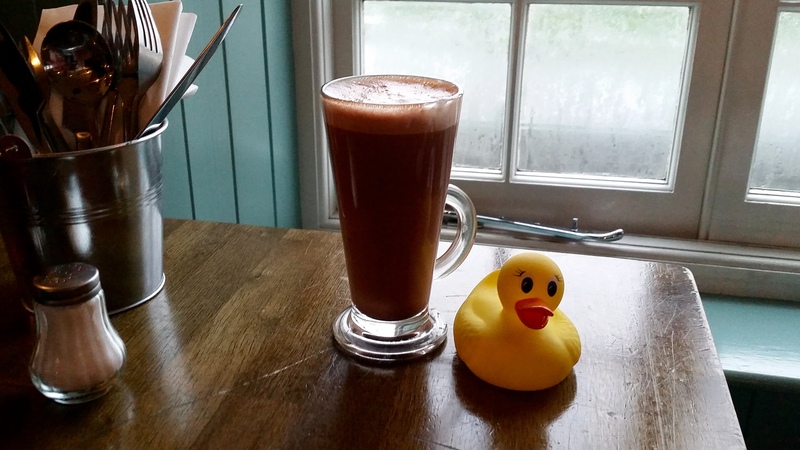 I certainly find very interesting friends when I travel, don’t I? 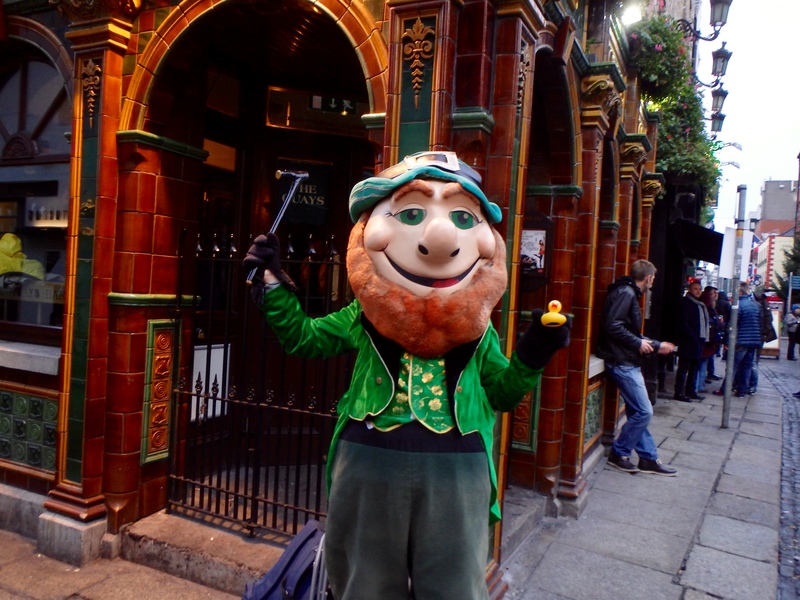 We visited and supported the Temple Bar Dublin. It was really fun. Of course, I made another new friend. I really like Ireland. Everyone was so nice, and a new friend came home with me. 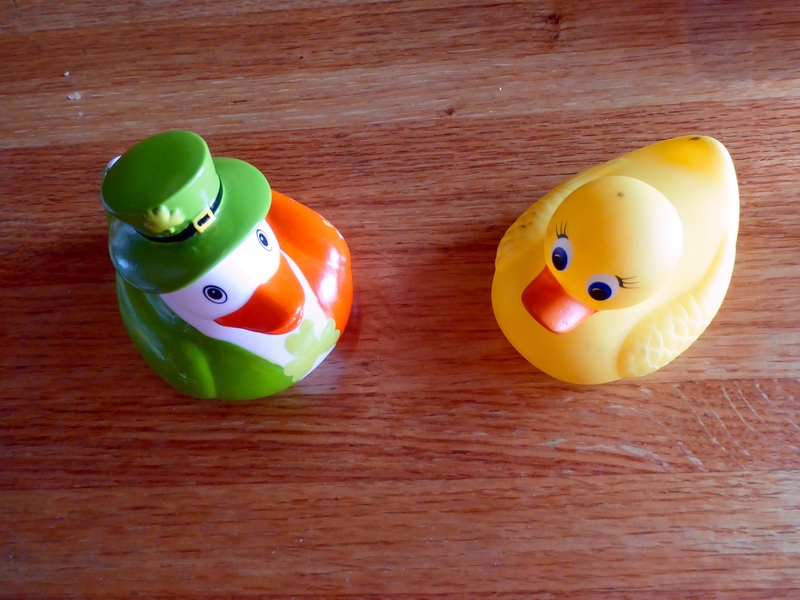 Ms. Ducky and her Irish friend. They both live in Colorado now. 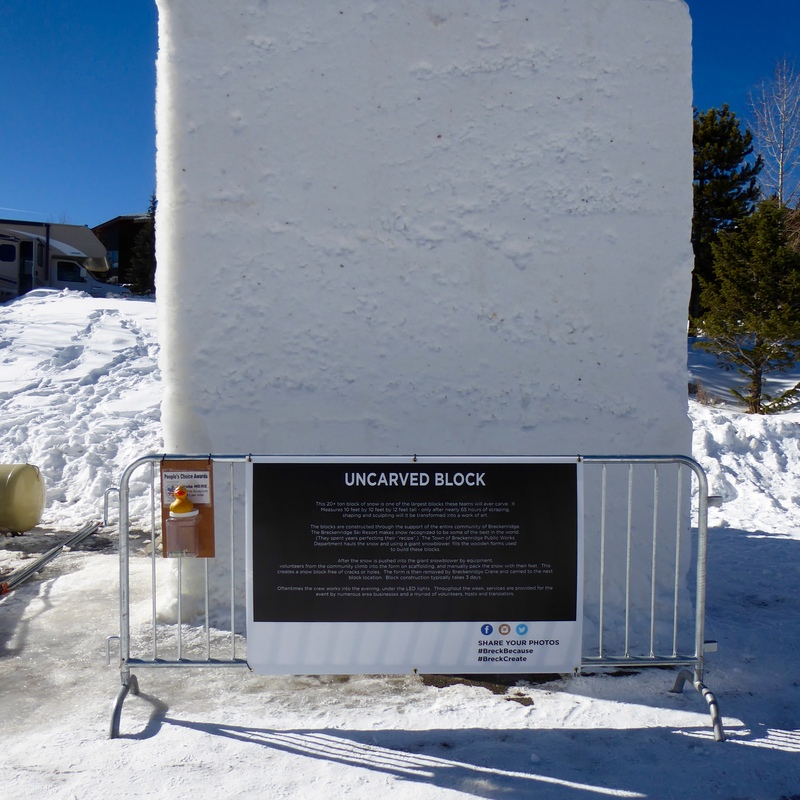 Let’s sculpt a 20 ton block of snow. 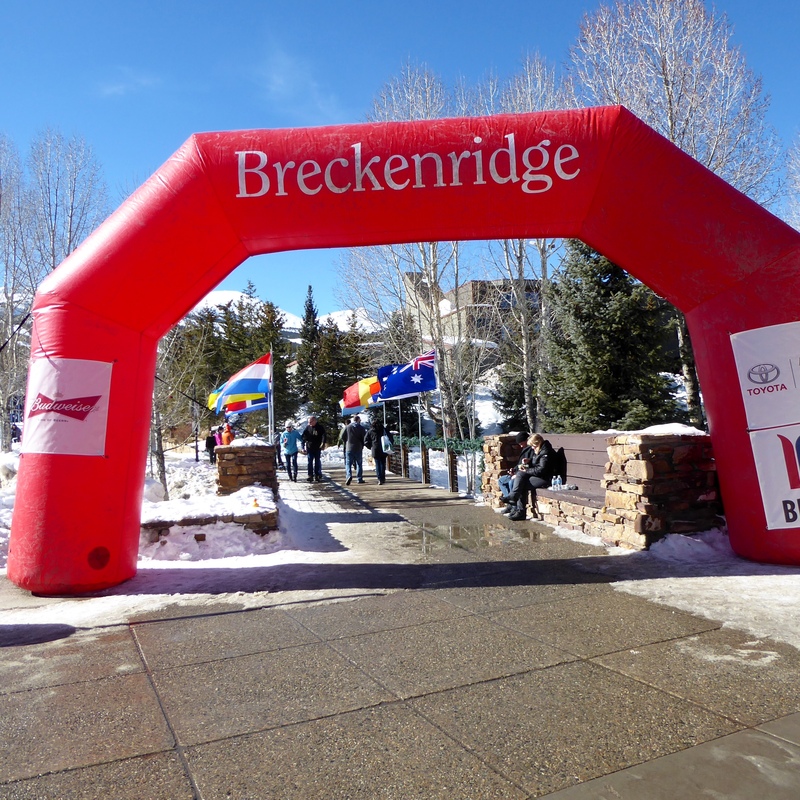 January in Breckenridge, Colorado brings the Budweiser International Snow Sculpture Championships. 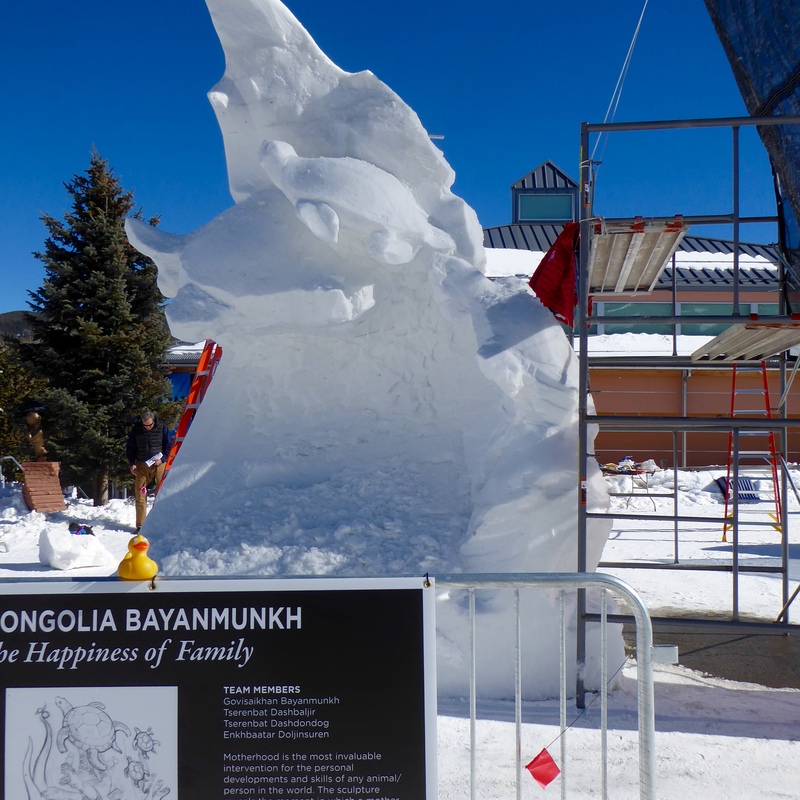 We usually go to Breckenridge to see the finished sculptures. However, this year mom is not working as a tax preparer, so we can go more often. 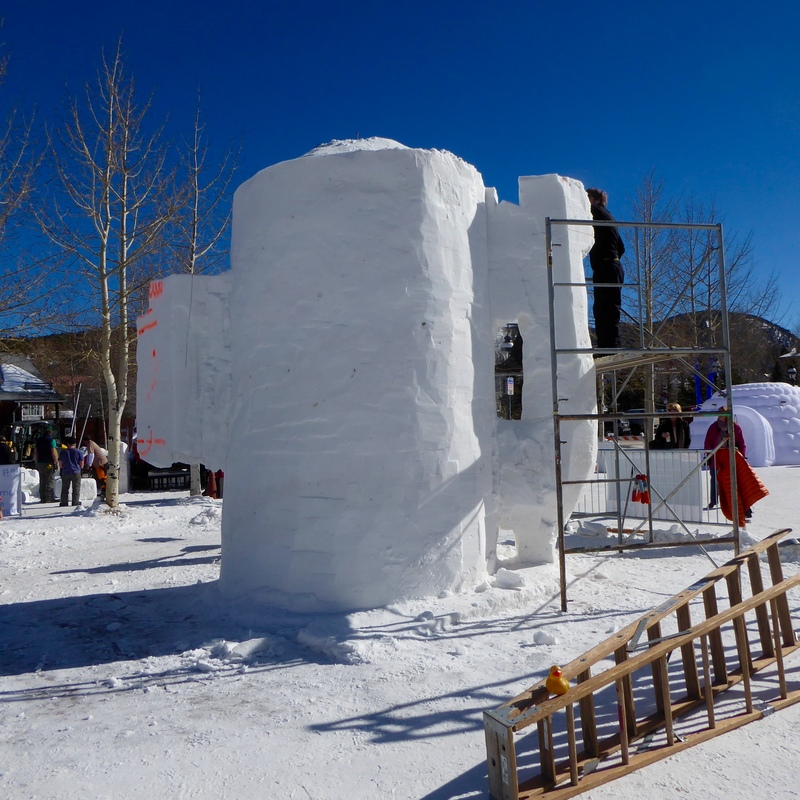 We watched the artists carve the 20 ton snow blocks. 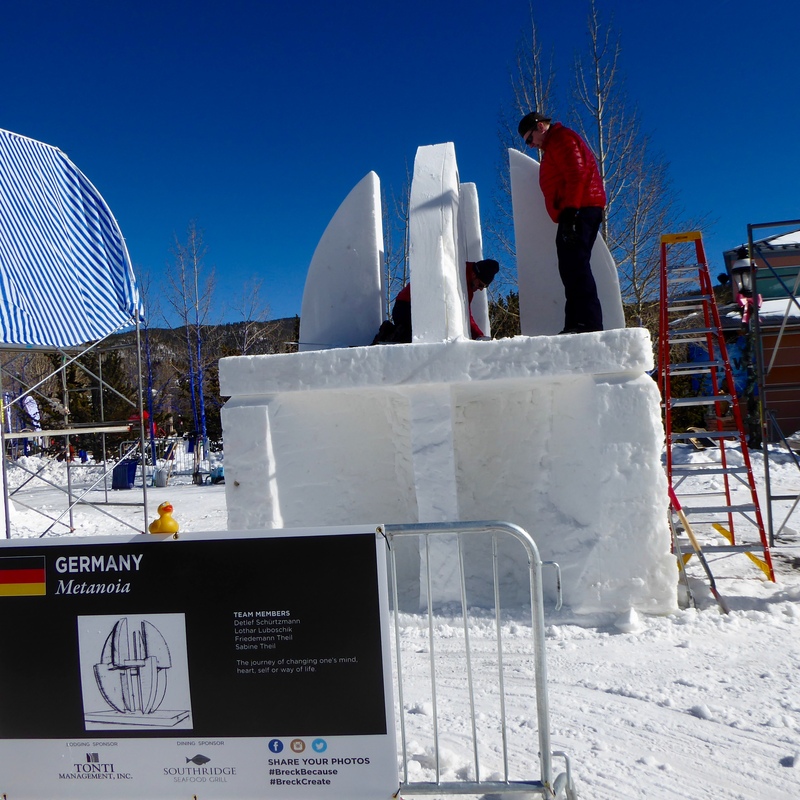 When a team wants to compete here, they must submit a drawing of their sculpture and a description. These are displayed during the competition. Team Germany’s entry, Metanoia, represents the journey of changing one’s mind, heart, self or way life. Mongolia shows The Happiness of Family. Motherhood is the most invaluable intervention for the personal developments and skills of any animal/person in the world. The sculpture reveals the moment in which a mother teaches her babies how to swim. Estonia sculpts Human Space. This sculpture from Budweiser is not entered in the competition. There was no drawing or explanation, but maybe… This Bud’s for You. Mongolia won the position of two sculptures. 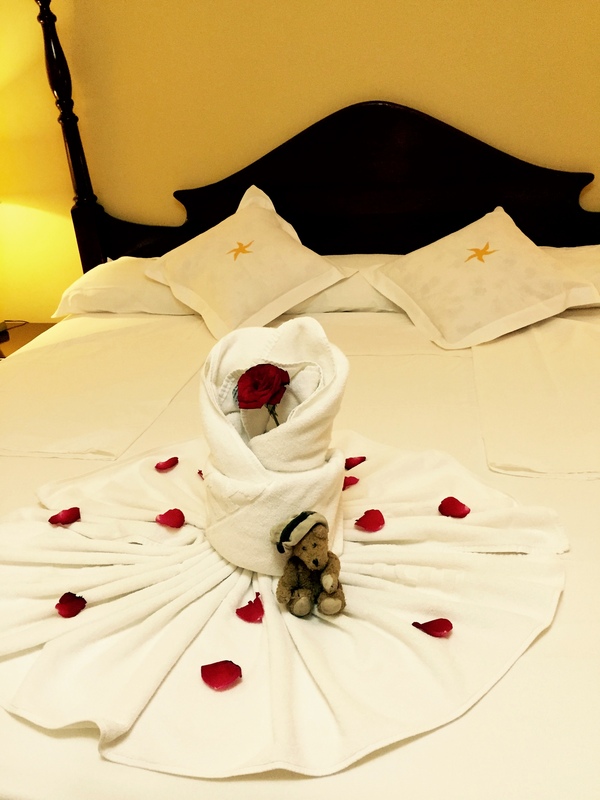 The Lion and Butterfly was being created here. 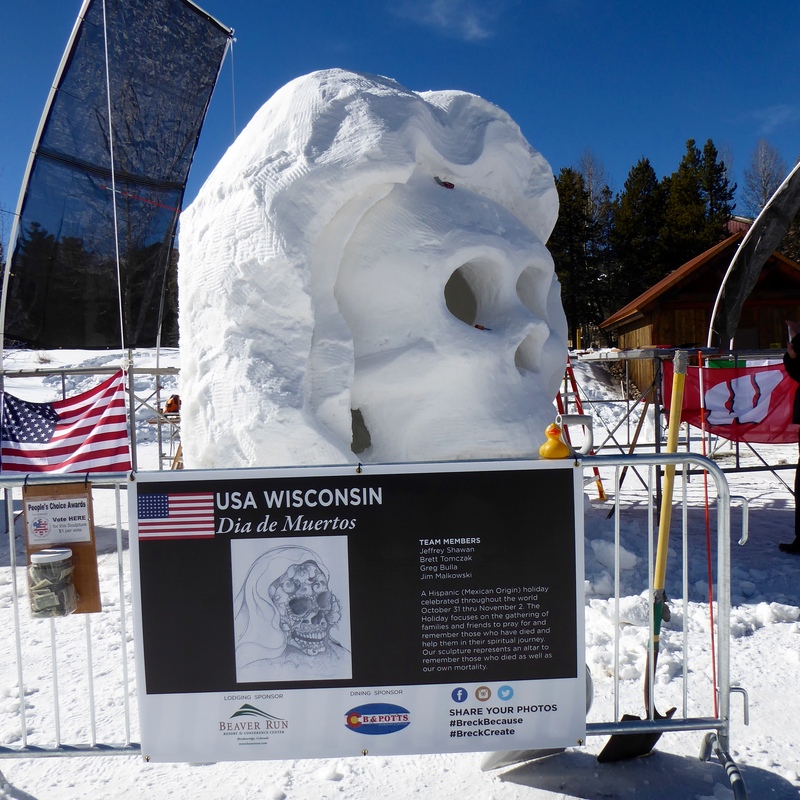 Team USA Wisconsin presents Dia de Muertos. The sculpture represents the holiday of Mexican origin from October 31 through November 2, honoring and remembering those who have left this life. Team USA Vermont presents Rhonda and her Recycling Robo-Octopus. We loved all of these sculptures. 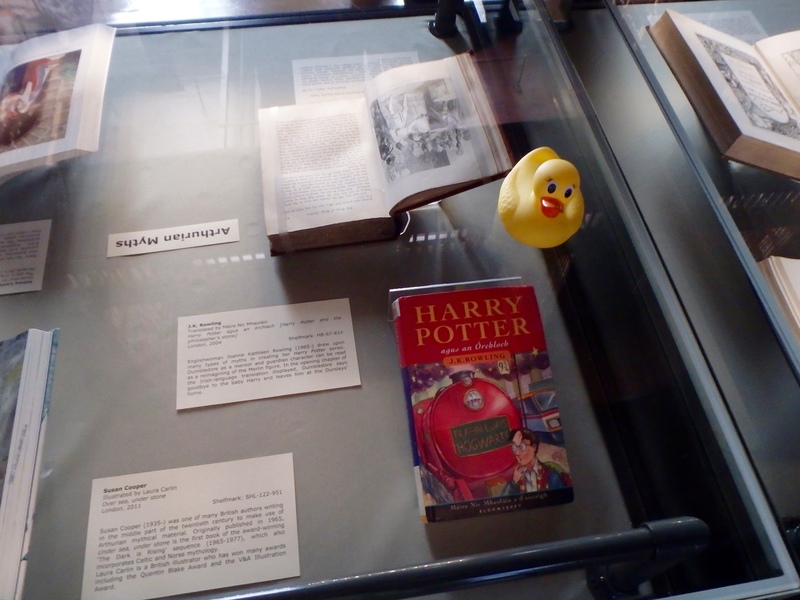 There are many more on display. The judging Saturday, January 30. 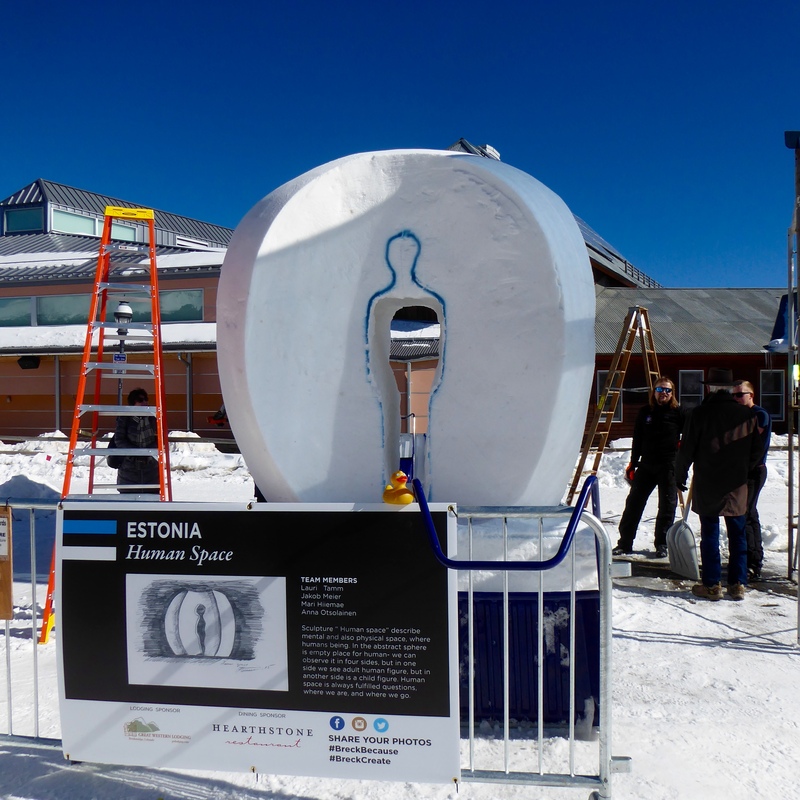 The sculptures will be on display through Sunday, February 7, weather permitting. 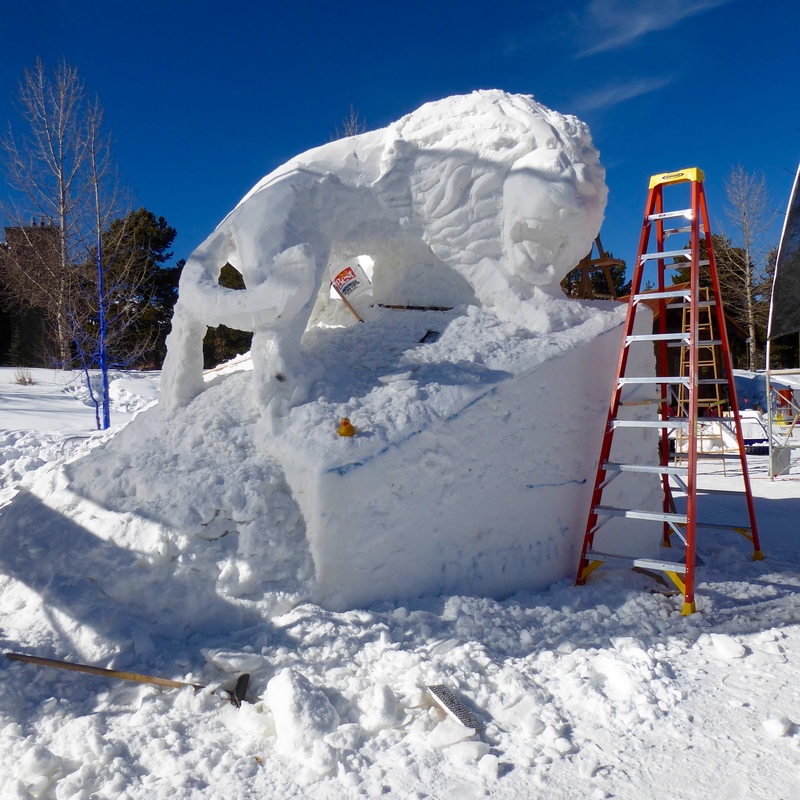 We hope you can go to Breckenridge to see these elaborate snow sculptures. 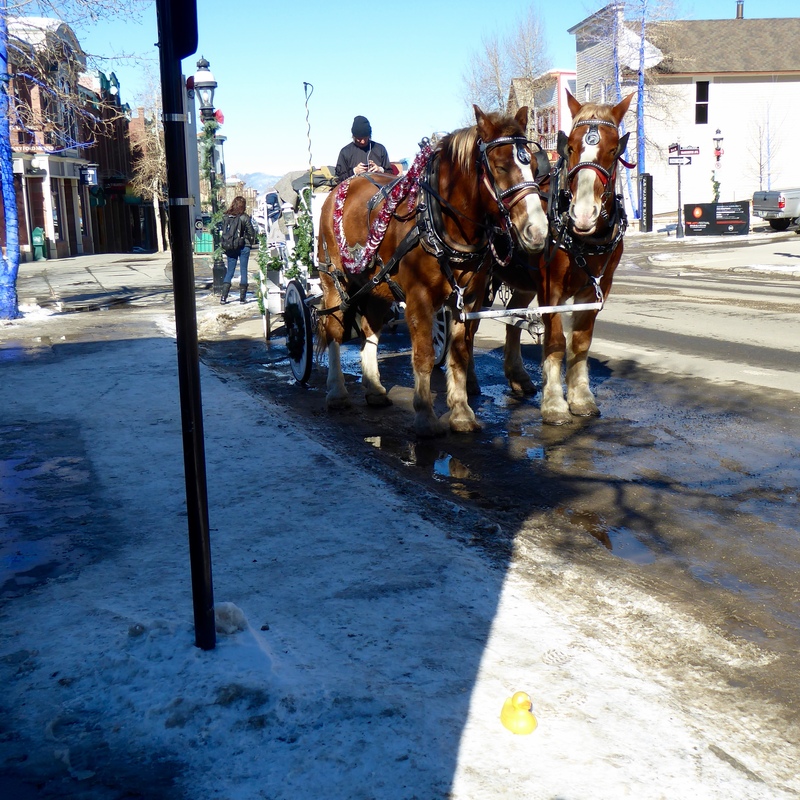 While we were in Breckenridge, we saw the horse cart. 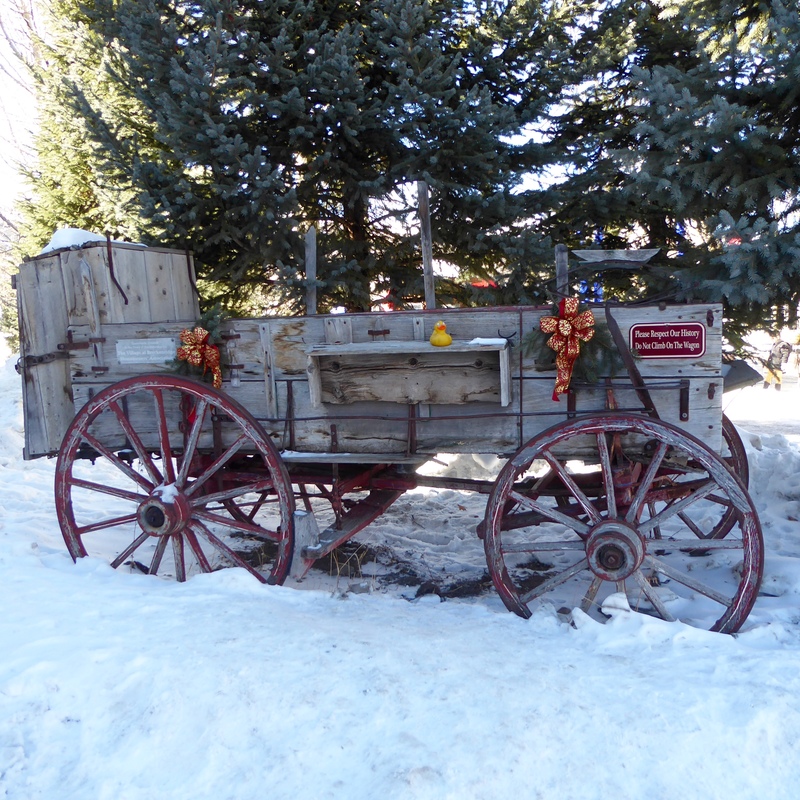 Also, near the Visitor’s Center, I sat on this wagon. 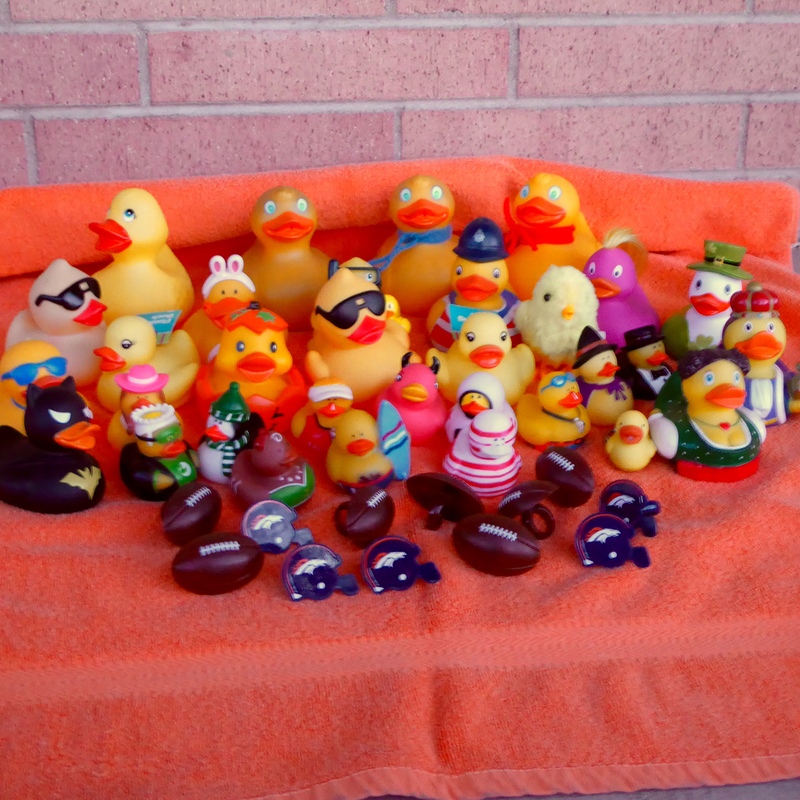 Humans cannot climb or sit on the wagon, but I, Zeb the Duck, am small enough that I was allowed to sit here. 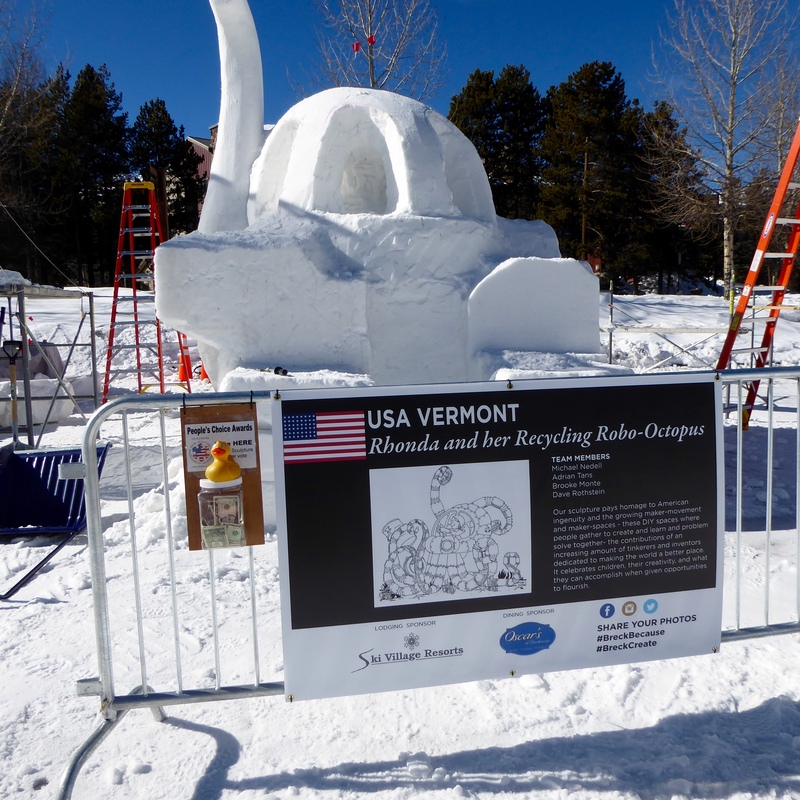 We, the Colorado Traveling Ducks, love Breckenridge and hope to see you there to view the completed snow sculptures of the 26th Annual Budweiser International Snow Sculpture Championships. 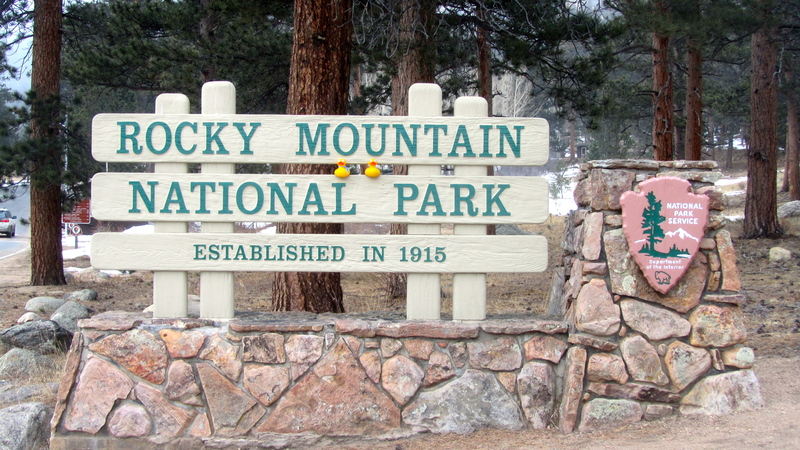 After stopping at the Visitor Information Center in Granby, Colorado we follow suggestions and take US 34 to County Road 6 to Arapaho National Recreation Area. 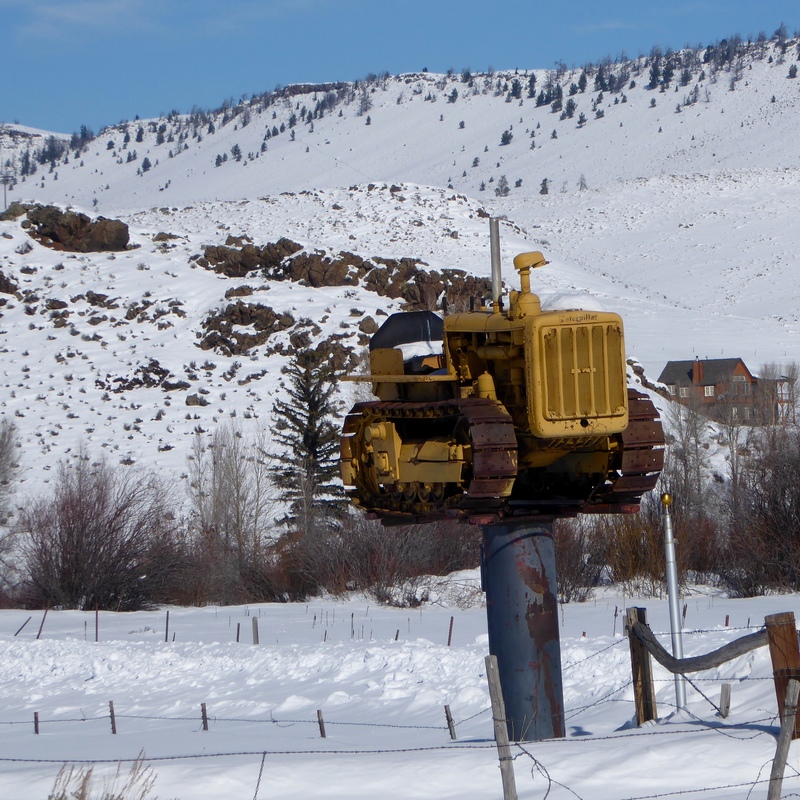 We pass this tractor, on a sign post. Soon we arrive at Arapaho National Recreation Area. 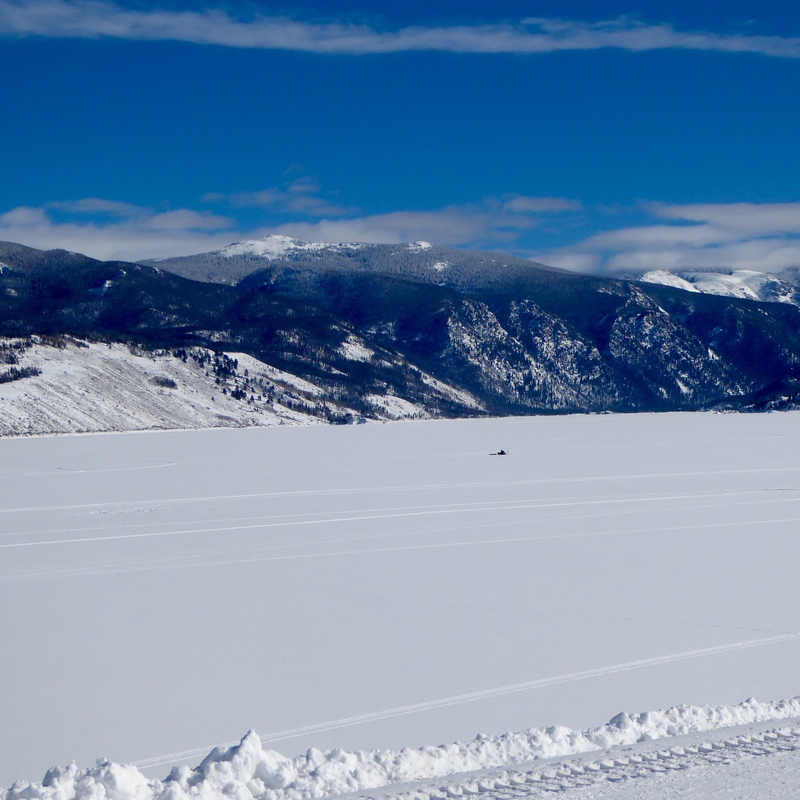 Lake Granby is frozen and there are some snowmobiles on the snow covered frozen lake. 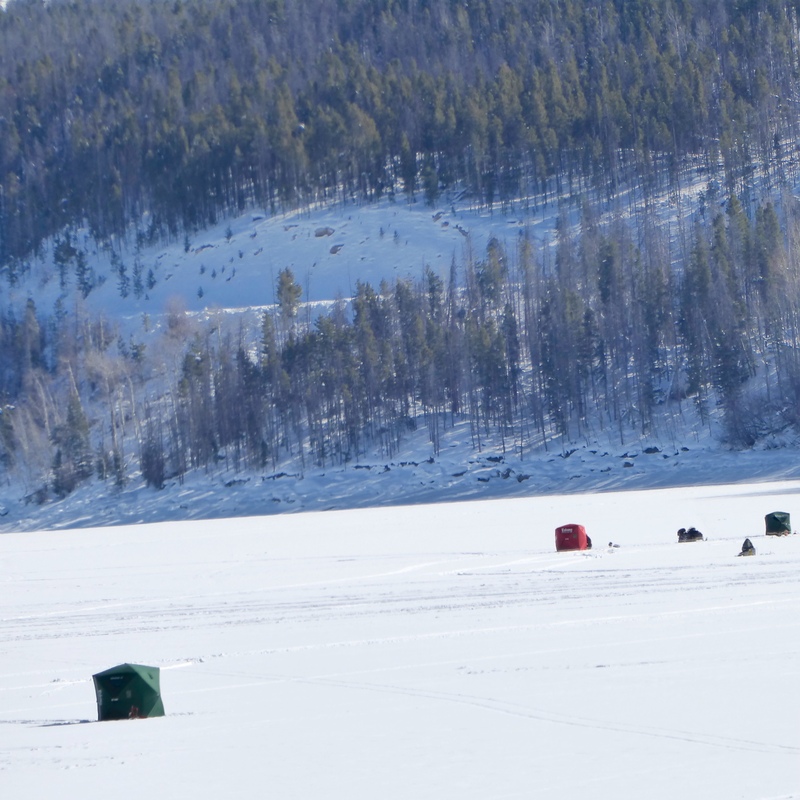 Many people love to ice fish and this is a great place. These humans are setting up to ice fish. Often humans set up shelters while ice fishing. Here we have three shelters. There are several on the lake today. Some people do not use a shelter. It is easier for us to see the fishing process without shelters. 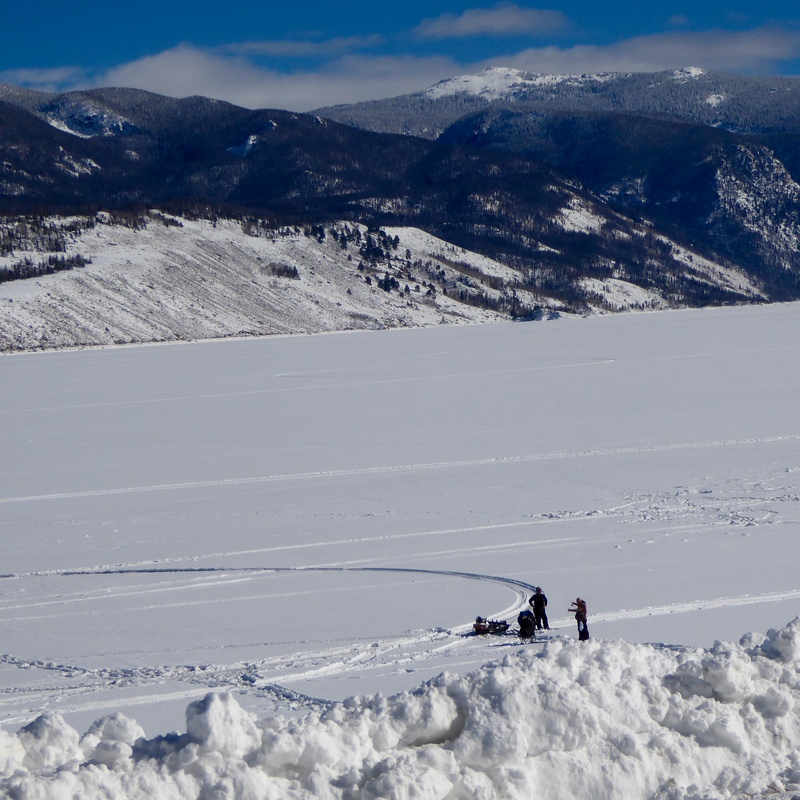 This weekend there will be 3 Lakes Ice Fishing Contest. Many humans will fish and compete for cash prizes. 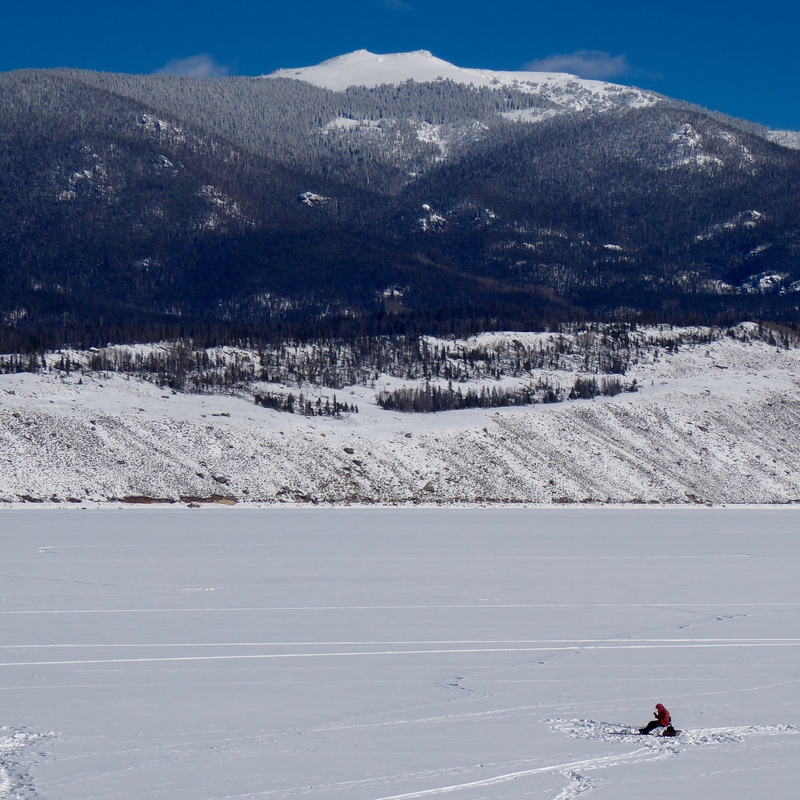 For information about this contest visit http://www.Colorado.com Scroll down a little to the Calendar of Events and click on 3 Lakes Ice Fishing Contest in Granby. There is a lot of snow here. 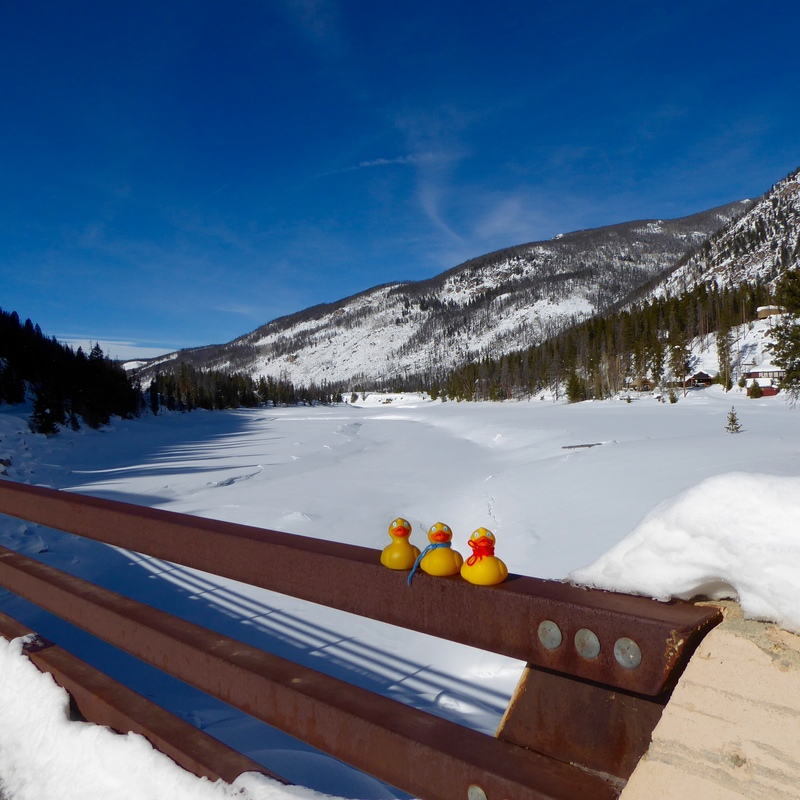 We three ducks are on a snow bank by Lake Granby. It was about 10 degrees here when we visited Friday. We did not sit on this snow very long. 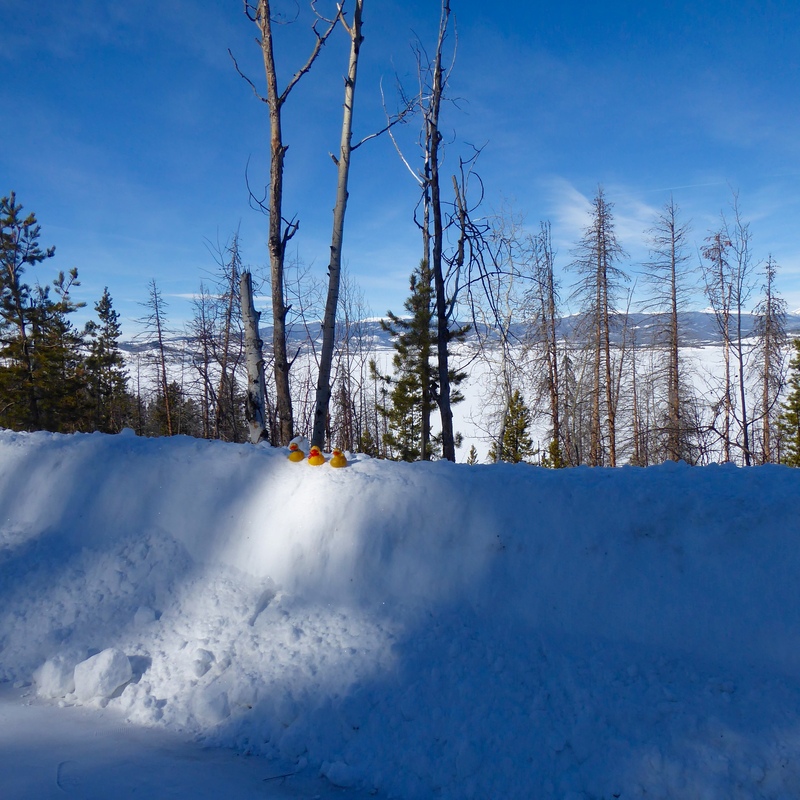 Near the end of Lake Granby is Arapaho Bay Campground. 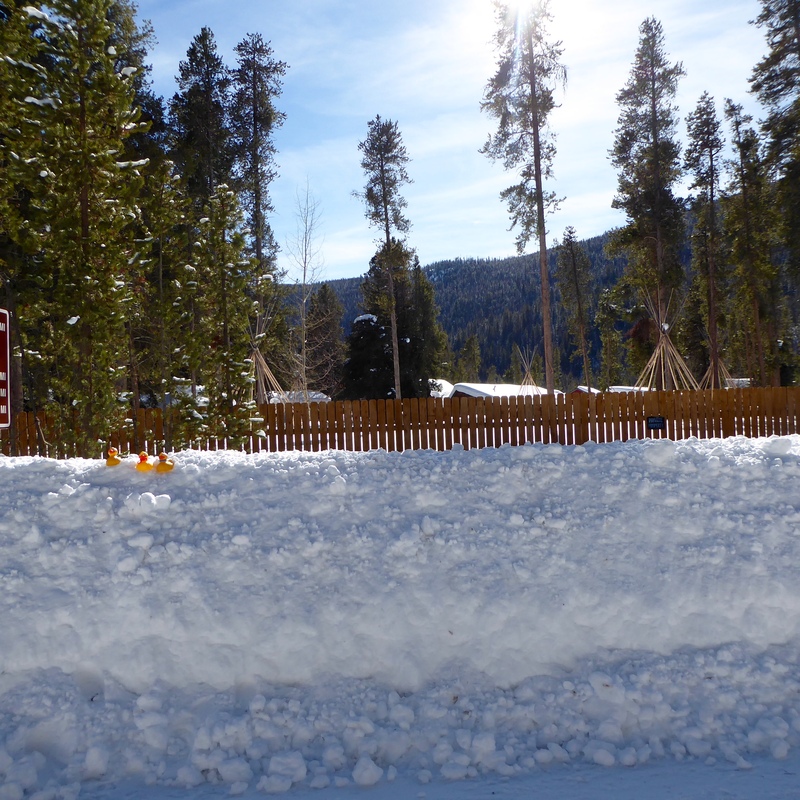 The section with cabins is closed for the winter. There are other campgrounds and picnic areas along the lake also. We want to come back here in the summer. We are on the bridge over the waterway connecting Lake Granby with Lake Monarch. We hope you visit this very pretty area some time this year. Maybe even this weekend for the 3 Lakes Ice Fishing Contest. Our Denver Broncos will welcome and hopefully defeat the New England Patriots today. The Patriots, from the Boston area, arrived in Denver Friday. Colorado is “United in Orange” to support our Denver Broncos. 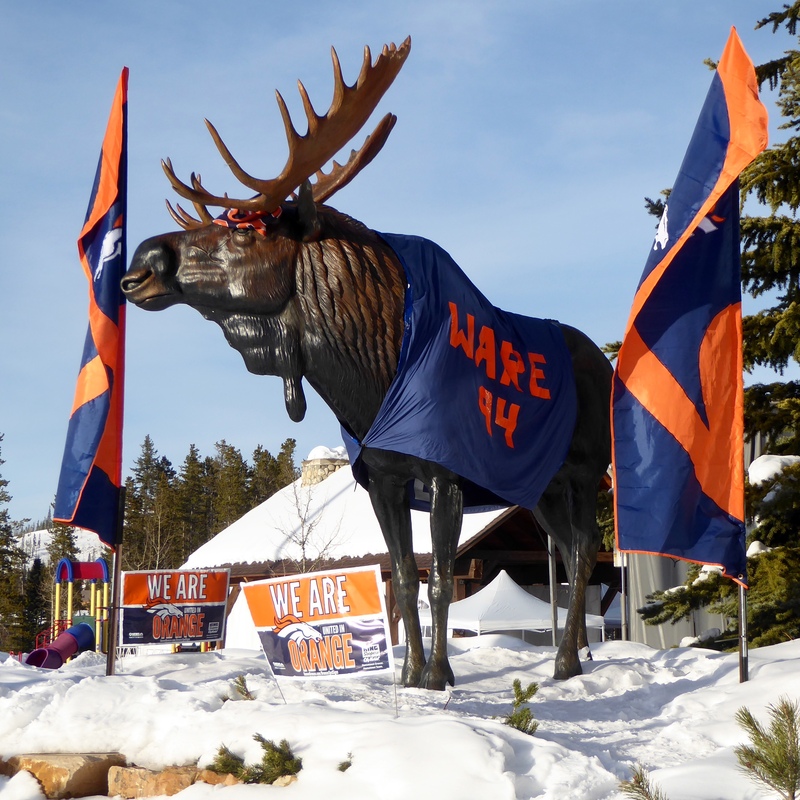 This Colorado Elk is on the lawn of Winter Park, Colorado Chamber of Commerce building. The winner of this game will go to Super Bowl 50 in Santa Clara, California in two weeks. Go Broncos! We love Colorado. From federal buildings to top ski resorts; from prairies to small frontier towns, the variety is wonderful. 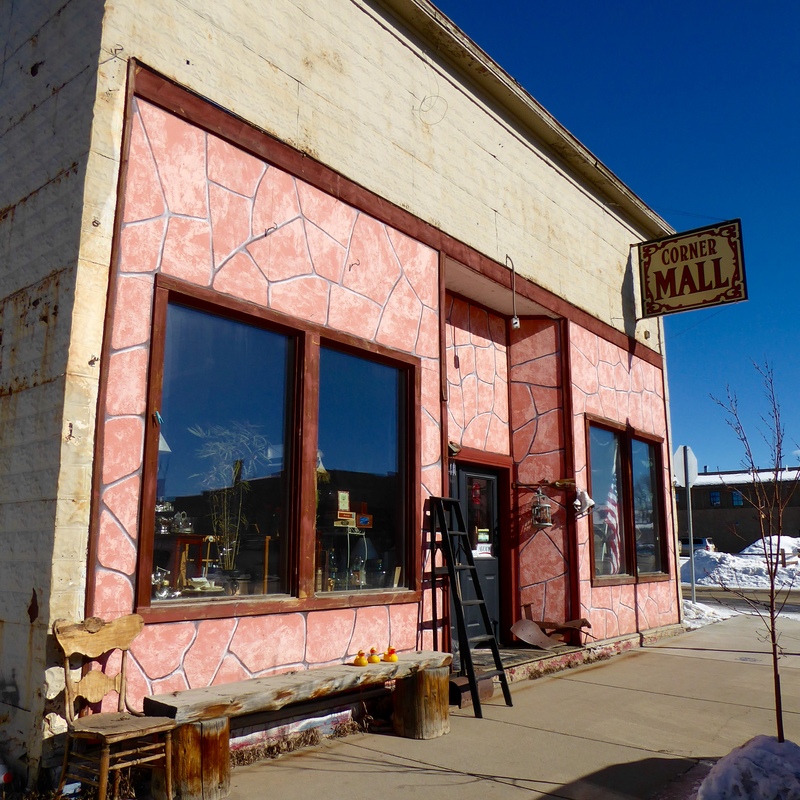 Granby, Colorado is an old feeling small town located in the mountains of northern Colorado. 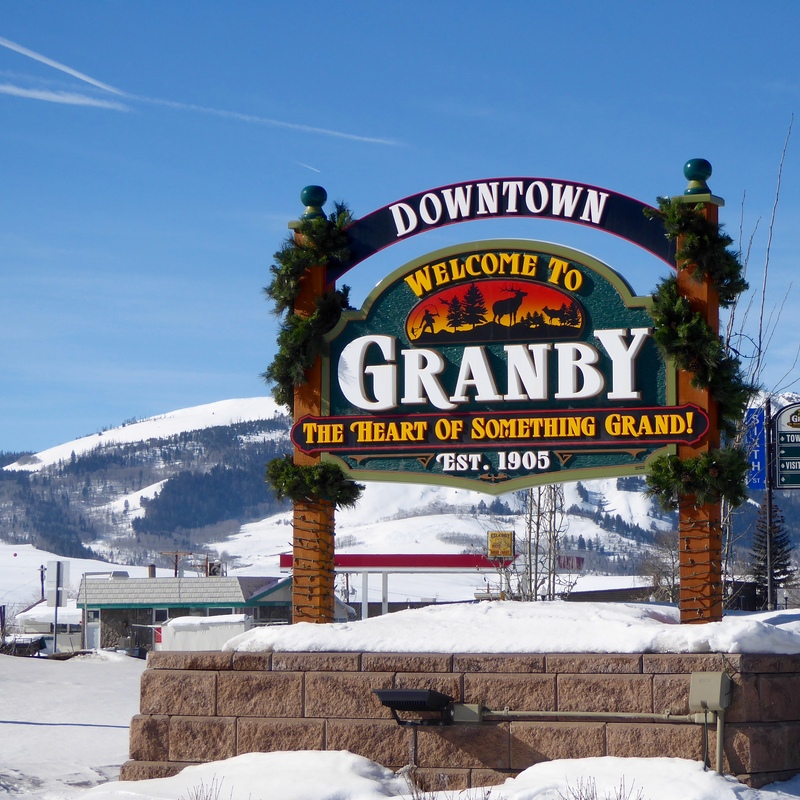 This sign welcomes us to Granby, a city in Grand County. The tourist office recommended we browse here, but the store was not open yet. 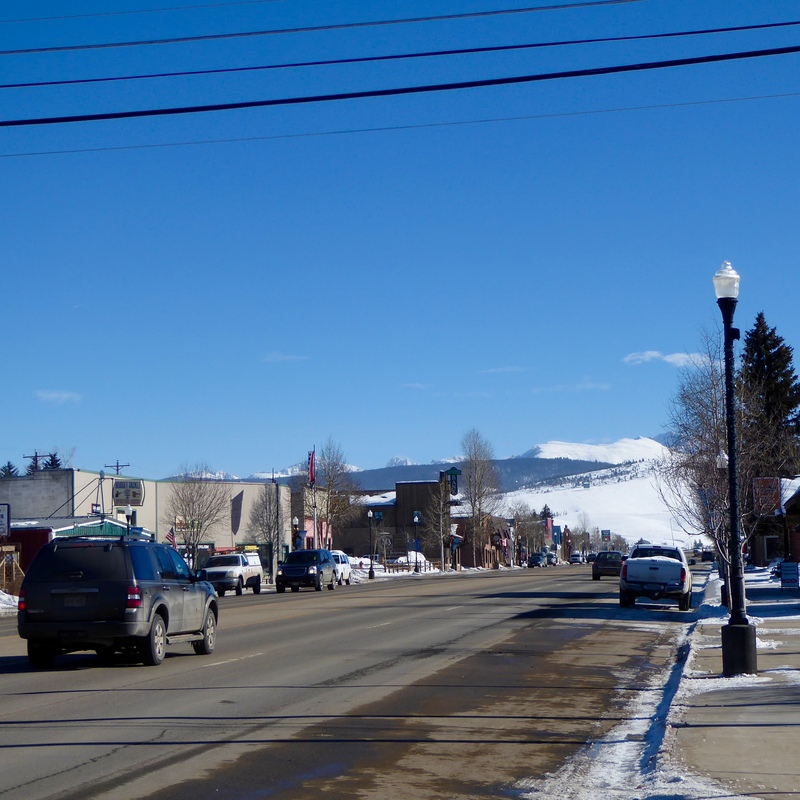 Main street in Granby highlights the mountainous geography and the wooden buildings. Granby’s main street. New snow in mountains and Colorado blue sky. 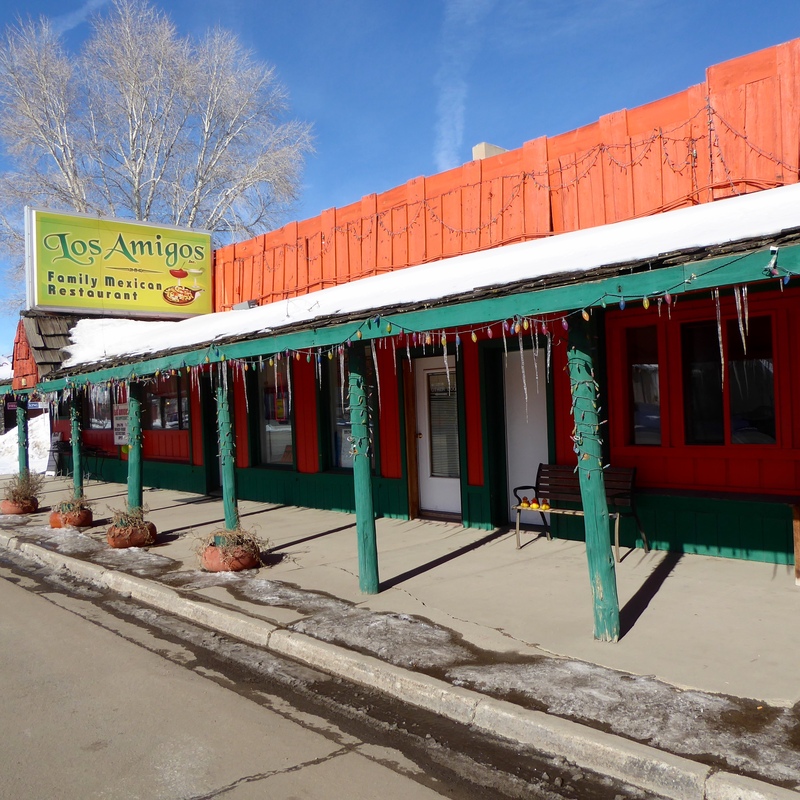 Los Amigos restaurant was highly recommended, but we arrived here too early in the day. 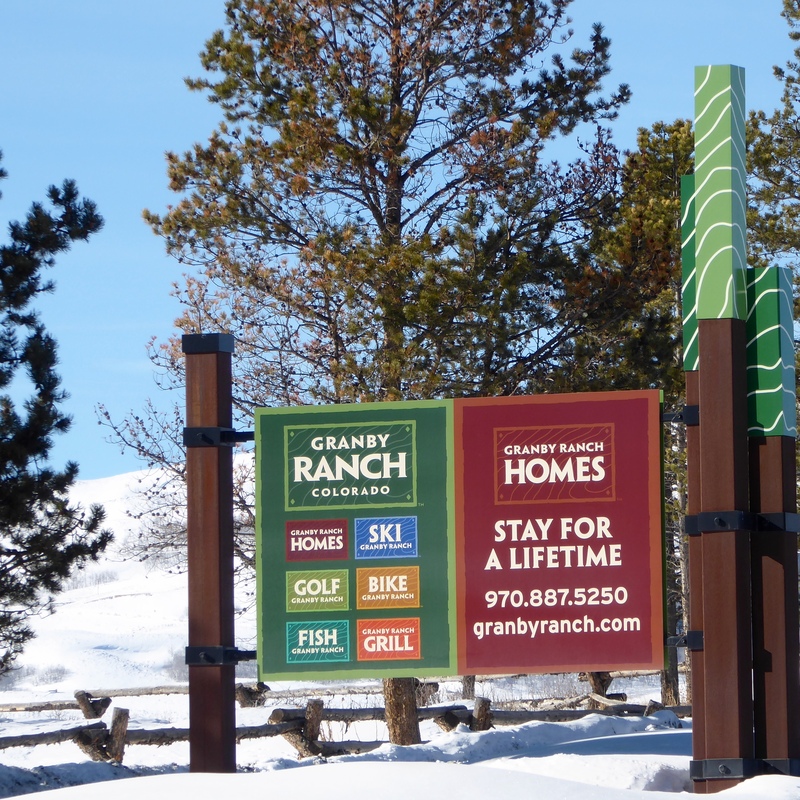 A few miles from downtown Granby we visited Granby Ranch. 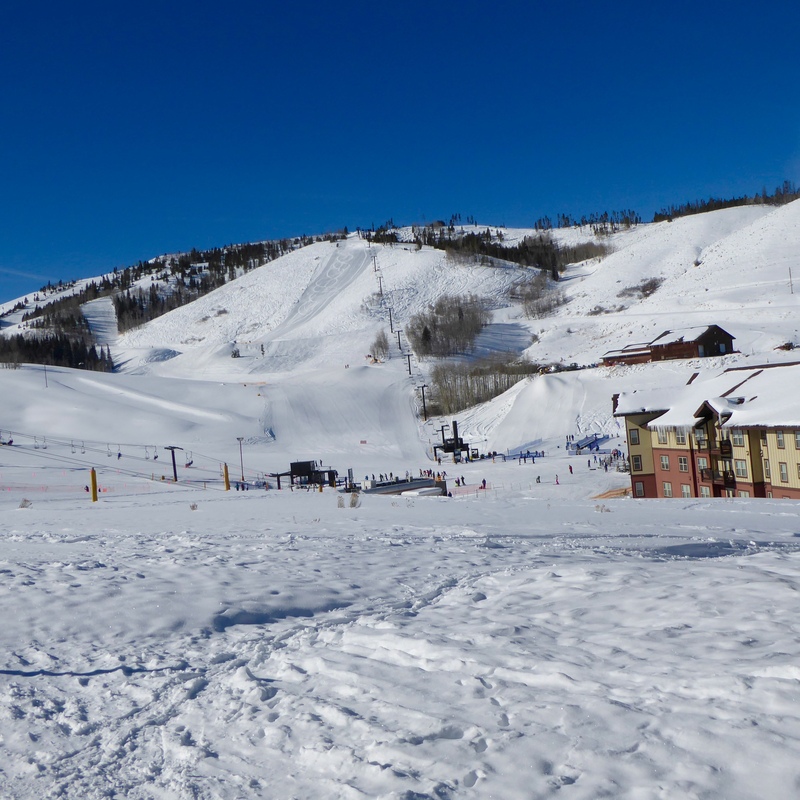 This newer development provides homeowners and visitors with outdoor activities, including skiing, fishing, and golfing or biking when weather permits. Several ski lifts cross the terrain for all levels of ski ability. 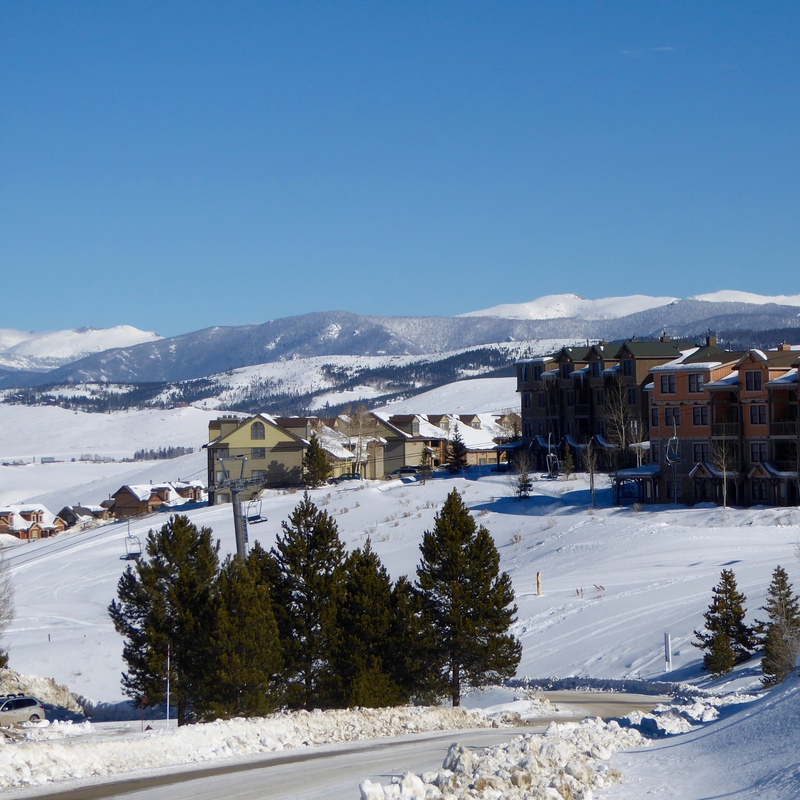 You can practically ski to your condo. 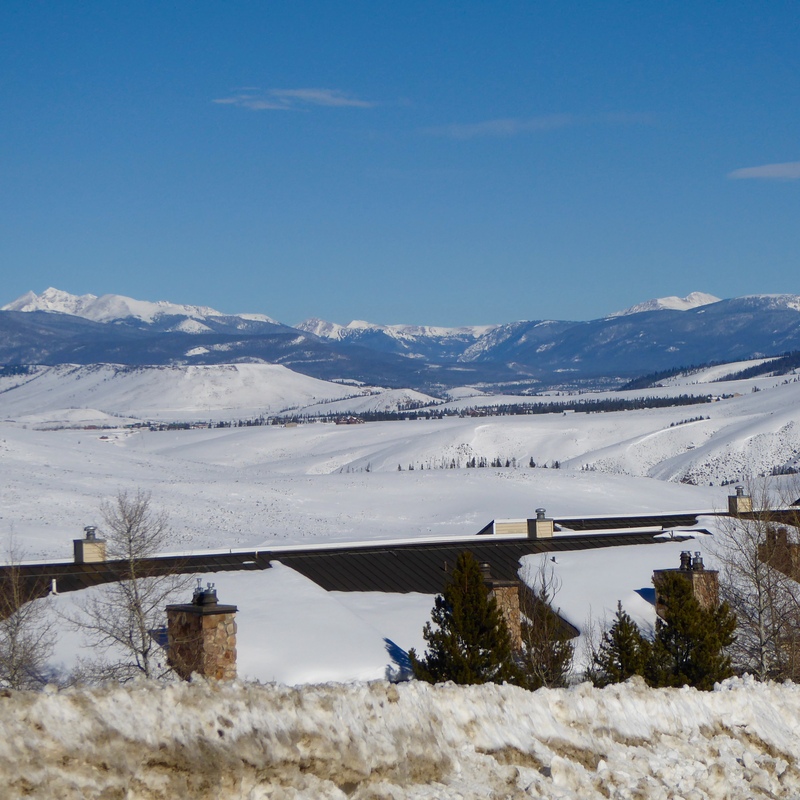 The homes and amenities are great, but the natural beauty of Colorado makes Granby Ranch special. Next time will we take you to another scenic area near Granby. We hope you enjoy Colorado soon.